Set of 4 cheese knives. The green knife is for soft cheeses like Brie or Cheddar. 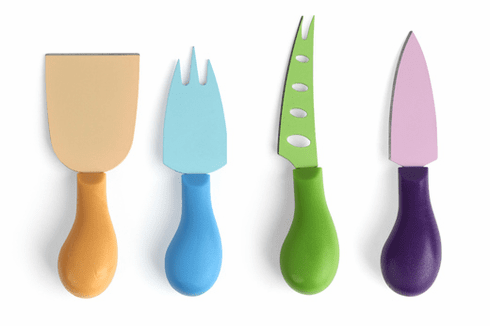 The purple knife is for slicing harder cheeses like Pecorino or aged cheeses. The yellow knife is ideal for crumbling hard cheeses such as Parmigiano. The blue fork is for holding the cheese while cutting or for serving. Cutting board not included.